The Google Drive quota, in the shot directly below, provides an overview of how much GD cloud storage space you’ve used up. However, sometimes the quota might highlight you’re using much more storage space than expected. If that’s so, it’s not usually the case that the Google Drive quota is inaccurate; just that it includes a lot of extra data from other sources. So if the quota highlights you have much less storage space than expected, this is how to fix it. Google Drive space not updating – According to users, sometimes their Google Drive space isn’t updating. This isn’t a serious issue, and sometimes it might take a few days for the space to update. If the amount of space doesn’t change, try removing files from your Trash and check if that helps. Google Drive full but no files – This is a similar issue, and sometimes your drive can appear full even if you don’t have too many files. To fix this issue, you need to remove Google Photos as well as attachments from Gmail. It can also be helpful to clean the Trash directory. Google Drive showing full when it’s not – This is another problem that can occur with Google Drive. If you encounter it, check if you have any shared folders. If other users are using your shared folders for storage, that will affect your data quota. Google Drive quota not accurate – Sometimes your Google Drive quota might not be fully accurate. If this happens, be sure to try some of our solutions and check if that solves the problem. Firstly, note that deleted Google Drive files go to a Trash folder similar to Recycle Bin. Thus, they’re not really erased and still hog cloud storage space. So you should empty the Trash folder as follows. Log in to your Google Drive. Click Trash on the left of the GD page as below. Then click Trash just beneath the search box, and select Empty trash from the menu. This could save you many gigabytes of storage. Click your Google Drive quota to check how much extra storage space you have. Now it will only include files you haven’t deleted. Note that applications connected to Google Drive also use up its storage space. Thus, apps such as Whatsapp might be hogging hundreds of megabytes of your cloud storage. This is how you can remove Google Drive apps. Click the Settings button at the top right of your Google Drive page. Then you can select Manage Apps in the Settings window shown below. That lists all your Google Drive apps. Now remove Google Drive apps by clicking the Options button beside them and selecting Disconnect from Drive. Press the Disconnect button to confirm. Many users reported that WhatsApp can also take up your storage space. According to users, there was WhatsApp application backup on their Google Drive, but after removing it, they managed to fix the issue with Google Drive quota, so be sure to try that. You might have lots of GD files without parent folders. These are orphaned files that can inflate the Google Drive storage quota. This is how you can search for and delete orphan files in Google Drive. Input is:unorganized owner:me into the Google Drive search box and press Enter. Google will search for and display any orphaned files. Delete them by right-clicking a file and selecting Remove from the context menu. Hold the Ctrl key to select multiple files to erase. You can also drag and drop the orphan files to Trash on the left Google Drive menu to delete them. Empty the Trash folder to fully erase. Note that your Google Drive quota also includes Google Photos and Gmail files. So your extra photos and email might also be inflating the GD quota. Clicking View Details beneath the quota pie chart highlights that as shown in the shot directly below. Log in to Google Photos and click the Main menu button at the top left. Then select Settings from the menu to open the options below. That page includes Original and High Quality settings. 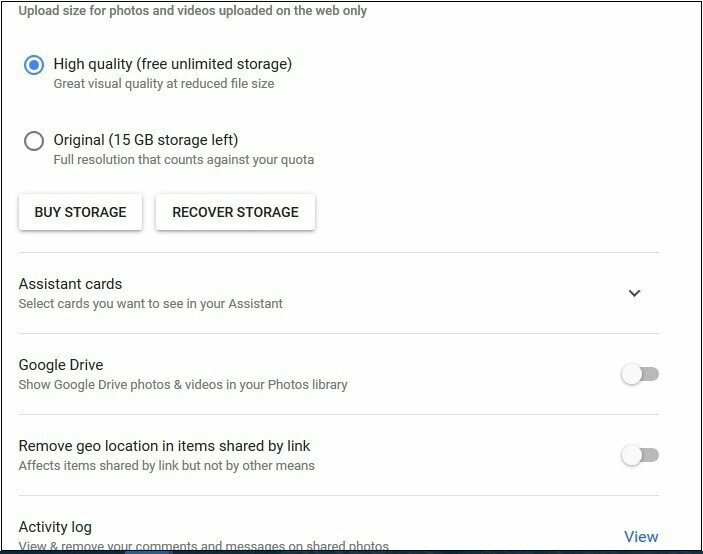 If Original is selected there, the photos will reduce your Google Drive storage space; so select High Quality on that page if required. Open your Gmail account, if you have one, and delete outdated emails from there. Emails in the trash should also be deleted. Click More > Trash on the left of your Gmail page. Click Empty Trash now to erase emails that also inflate the Google Drive storage quota. According to users, sometimes shared folders can affect your data quota, even if you don’t use them. If you have shared a folder with other users, their data usage will reflect on your bandwidth. To fix the problem, keep a close eye on shared folders. If you have any shared folders, be sure to contact the person you’re sharing the folder with, and ask them to back up their files. Once their files are downloaded, you can delete the folder and all its contents. After the shared directories are deleted, the issue with data quota should be resolved. The easiest way to fix the problem with Google Drive quota is to delete the large files from your Google Drive. However, it’s worth mentioning that it might take some time for the data quota to update. Usually this process takes a couple of days, but some users reported that it might take weeks for the quote to update, so you’ll have to be patient. According to users, to fix the problem with quota and Google Drive, first you need to delete all files from the Trash folder. We already showed you how to do that in one of our previous solutions, so be sure to check it out for detailed instructions. Open Gmail in your web browser. Once you sign-in, scroll all the way down. In the bottom right corner you should see Last account activity message. Click on Details. Now you’ll see all recent web sessions. Click Sign out all other web sessions button. After doing that, you should be successfully signed out on all accounts. Now log in to Google Drive again and check if the problem still persists. 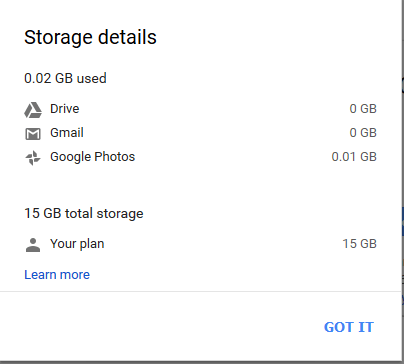 As you probably know, Google Photos shares the storage space with Google Drive, and if you have a lot of pictures in Google Photos app, that will reflect on your Google Drive quota. To fix this problem, users are suggesting to remove pictures from your Google Photos and check if that solves the issue. Several users reported that removing the pictures from Google Photos won’t permanently solve your data quota problem. To fix the issue, you need to access Google Photos on all your devices and remove your pictures from there. Even if you remove pictures from the web version of Google Photos, your other devices might sync the missing pictures again, causing the issue to reappear. Therefore it’s crucial that you delete pictures from Google Photos on all your devices in order to permanently fix the problem. Several users reported that this worked for them, so feel free to try it out. 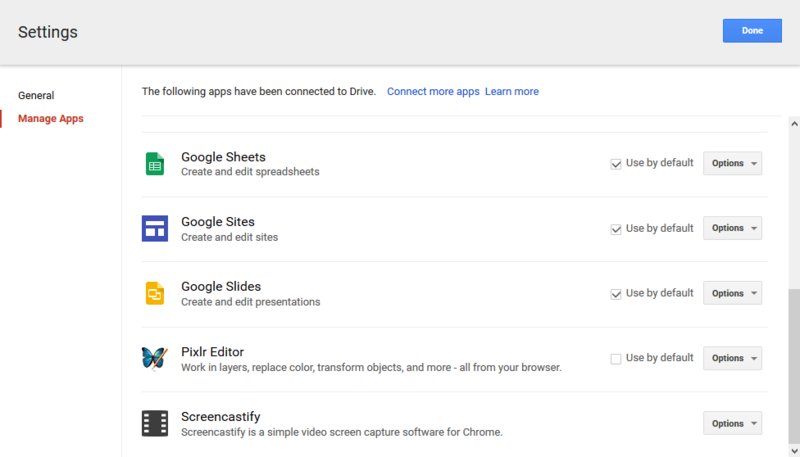 As you probably know, Google Drive allows you to create documents and spreadsheets using its own web apps. Unlike Word, Excel or PDF documents, these documents don’t take up any space. It’s also worth mentioning that you can convert your documents to this format and save some space. Open your Google Drive in a web browser. Locate the document you want to convert, right-click it and choose Open With. Now select the desired application from the list. Google Drive will now create a copy of your document. Once the new document is created, you can delete the original document. Before deleting the original, be sure to check if the new document is working properly. This can be a tedious solution, especially if you have dozens of online documents, but it might help you free up some space. Now your Google Drive quota will surely have more free storage space than before. Then the storage quota will probably add up a lot better. Also, note that any changes you make to Google Drive might need a few days for the Google servers to sync. Editor’s Note: This post was originally published in January 2017 and has been since completely revamped and updated for freshness, accuracy, and comprehensiveness.